River Saraswati (Ghaggar, Haryana) - The Lost Valley of time, culture and civilization - Ghumakkar - Inspiring travel experiences. When do you get the opportunity to touch a wall built about 4500 years ago? I guess not always! That is why the opportunity to visit the live excavation site for Indus Valley Culture grabbed the top spot on my priority list. It was middle of winter and we were headed for some obscure town in the hinterland of Haryana. The road passed through some green fields, some crowded towns, some surprisingly lavishly built houses in the midst of poor and dirty ones and most of all through the cows and buffaloes and some strong bulls. Not to forget the fronts of the houses had their owners sitting for a leisurely hukka along with their buddies all clad in whites with a shawl around and a pair of questioning eyes! Now why were we in Haryana of all the places? We need to get some background on Indus Valley culture over here to appreciate our destination. We all know about Harappa and Mohenjo-Daro as principle sites of Indus culture. Now Indus or Harappan culture refers to archeological finds pertaining to time period of 2500-1900 BC having specific similarities. The distinguishing characteristic of this culture is presence of town planning evident in spacious perpendicular roads, sewerage system, fortified townships and large houses with courtyard and brick walls. Findings of seals, weights, beads, gold ornaments indicate flourished trade. The pottery is again painted fine with geometric design and baked to perfection. In all, it was a culture of then urban people who enjoyed good life. Certain sites show the initial phase of this culture known as early Harappan pegged at 3200-2500 BC. The declining phase is termed as late Harappan and is dated at 1900-1300 BC. The name Indus valley culture was given primarily because most of the sites of this culture were found in Indus valley after the first excavation in 1922. Post independence, since both Mohenjo-Daro and Harappa became part of Pakistan, Indian archeologists were keen to find similar site on Indian soil. And they were not disappointed at all. 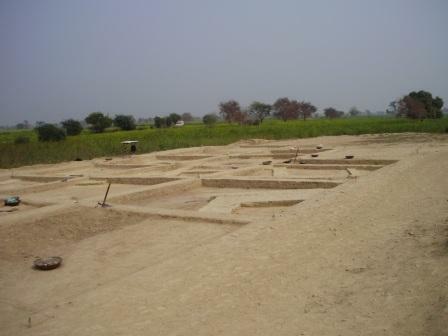 We now have almost 1000+ Indus valley sites in India belonging to early, mature and late cultures. Most of them are in the so called Saraswati river valley hence, many insist on calling this culture as Sindhu-Saraswati culture. Now where is this Saraswati river? All Indians believe in their hearts that Saraswati river once flowed on this land and there is ample literary evidence in the scriptures to prove it. Rigved mentions Saraswati in glorious terms, a river more prominent than Indus or Ganga. Mahabhaarat records the event that Saraswati is vanishing in the desert, the place called as Vinashan Tirtha and Balram having done Saraswati Parikrama. It is assumed that Ghaggar River in India and Hakra-Nara channel in Pakistan must be the old river bed of Saraswati. Ghaggar is not a perennial river as it originates in Shivalik mountains. Hence it is much likely that Satluj from west and Yamuna from east were the major tributaries of Saraswati thus giving her substantial water load. Saraswati dried up because of tectonic movements and these major tributaries changed their course and decided not to join Saraswati. This must have happened at around 1900 B.C. 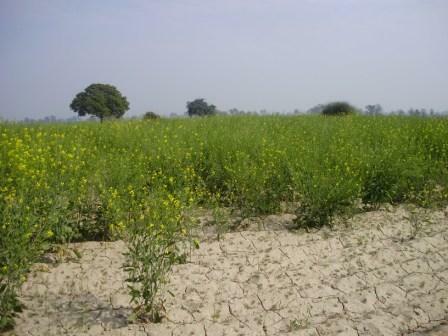 It had a great impact on environment as the fertile land turned arid. 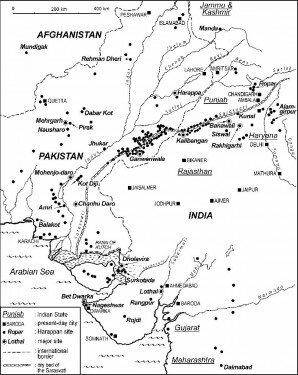 Decline of Indus culture is also attributed to the same reason of climate change. Late Harappan culture shows marked down gradation in the quality of pottery, town and artifacts. It is assumed that the trade declined, people left their cities and spread outside this land for greener pastures. And now, Haryana is where the Ghaggar flows, and thus we were at an Indus valley site where excavation was going on. This site is in the vicinity of Chautang river, a tributary of Ghaggar and formerly called Dwishdwati. It was one of a kind of experience! 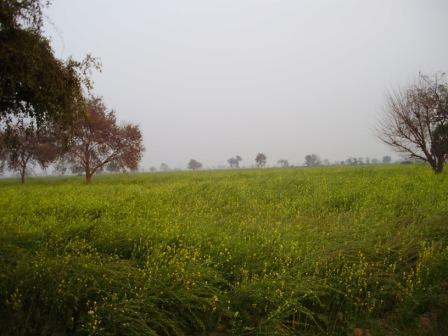 The famous ‘Sarasoke khet’ all around us, lovely bright yellow flowers spread across acres, the green fields of wheat giving an equally beautiful alternate to the eyes. The flattest land I have ever seen, not a hill in the site, the air fresh and morning mist reluctant to go away, the dawn of each day was a site to behold. There were lakes and there were happy buffaloes relaxing in it, dew drops still waiting on the leaves and sun rays trying hard to make inroads to reach us. 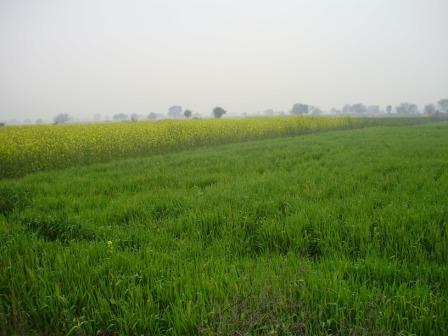 The excavation site was in the middle of mustard fields as usual on a slight mound. And archeologists had exposed a house and a road. House had rectangular rooms, a hearth, storage pits and front door opening in side lane and not on the main road. How thoughtful, precisely the reason why Indus culture is regarded as one of the advanced and mature culture of the past era. Sipping the tea made on a makeshift fire I looked around. All shades of green and yellow smiled at me, backdrop of clear blue sky and buff alluvial soil, it was a riot of colors, unexpectedly from the most simple, rustic surroundings. The brickwork of a forgotten era, the pottery scattered around and serene calm; as if it was a different world, different times and the landscape a witness. Leaving the excavation site, we made a detour to Rakhigarhi, some 40 km from Hissar, India’s biggest Harappan site, in terms of area. And what a mess the site was! Seven mounds of site, most of it encroached by village folks for drying cow dung. The excavation here had to be stopped since workers themselves stole the artifacts and sold them in black market. Today the site is unguarded, people of the village totally ignorant and not a signboard to tell us about the greatness of this site. Only the loads of potsherd, bangles, beads and a Harappan citadel wall standing tall in the middle of the town, all robbed of its glory and now resembling a dirty heap of mud. It was a sad picture, even more disturbing when the young folks of the town gathered all around us and followed us from place to place. I think that was the real taste of Haryana where we did not see a single woman on the road and those we saw had their faces covered completely. Lothal, Dholavira and Kalibangan are some more important sites and I have heard that Dholavira is well maintained in a showcase fashion. I hope Rakhigarhi also gets it’s due importance and people become more aware of their cultural wealth. Till then I will cherish the memories of the nature and culture, so picturesque and so enchanting and so live in our genes! Very well narrated account of some of the Indus Valley Culture sites in Haryana. I have heard about another important Harappan site at Banawali in Haryana. it is believed that there was a small village, which turned into a town in about 2300 B.C. and then declined. I think other sites of the Harappan civilization found in Haryana include Balu, Siswal, Mithathal and Rakhigarhi, about which you mentioned above. You have talked about Dholavira. I believe that Dholavira, one of the largest sites of Harappan civilization is located somewhere on island in the Rann of Katch in Gujarat. Thanks for reminding us about these places. Shall look forward to forthcoming contributions. Beautifully written Manisha. Third picture is very beautiful and very well composed. It was sad to know that a process of excavation once started has left in between, I also wondered that why then a new one has been started? Anyway I wish that this time they will not leave it unguarded. Fourth picture depicting excavation process looked very interesting. I wished that you could have posted more pictures of the site, for example of that house with its doors in side lane. Very interesting information about Saraswati as well. I think in Gujarat around Somnath they still consider a stream as Sarsawati. Sad part is that many rivers that were once perennial are getting dried up, not even filling during the rainy seasons. Ramji, you are spot on about the other Haryana based sites. Banavali is indeed a big one. Dholavira and Lothal both are in Gujrath. Manish, We do have very sorry site regarding many excavation sites in India, Normally local people start using that land for farming,construction etc. Rakhigarhi especially needs attention as at is largest Harappan settlement in India , and I believe in the subcontinent, but it is neglected. About the excavated houses and the road, it is only at the plinth level, and unfortunately a photo does not give complete idea, but I will try to put up some. I would search for road directions of these places and see if I can make a quick visit, since it doesn’t see too far from Delhi. It is a shame indeed that this once great civilization lies in ruins, pun intended. Liked your post. Dholavira and Lothal both are in Gujarat. I think I will plan a trip here soon. Thank you for the information. It is about 4 hours drive from Delhi. If you are planning a trip to Rakhigarhi, then take NH10 till Meham and then reach Narnaund�. after that I really don�t know. There is not much to see in Rakhigarhi, however try to locate certain Mr. Vazirchand Rastogi. He has great collection of antiquities and is himself quite knowledgeable about Harappan culture. Visiting Harappa galary in National Museum before this trip, might be helpful. thanks a lot Manisha for visiting this place and giving a true account. otherwise it would been just a fact in school history books. i hope someone can vist / ( and narrate ) the gujarath sites too as well as the undersea remains of Dwarka. 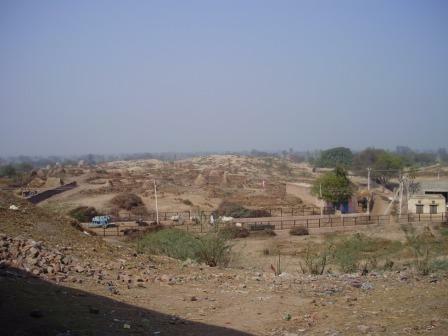 Kindly send the photographs of archaeological site- Balu in Haryana. I will be thankful to you for this job. Manisha Chitale, thanks for your beautiful article and the pictures. I myself is an ardent fan of Sarasvati River. I had been doing quite research on this river now for quite some time and I recently started a blog on Sarasvati River. The Rig Veda mentions River Sarasvati in glorious ways. Is there any thing we as invididuals can do to protect Rakigarhi ?. Monetarily I would like to make some contribution by next year. If any invididual is serious about further excavation in Rakigarhi, I would like to take a loan and sponsor this archaelogical excavation. We just can’t let villagers and robbers steal the national heritage. What is the ASI doing to protect this site ?. What is the government of Haryana doing to protect this site ?. Any way, when the archaelogical excavation at important sites in Pakistan are going so nicely our government is so careless and unconcerned about protecting sites on Indian side. Please reply if you have any thing you would want me to do to protect this important site. I may visit this place in my next India trip if time permits. Thanks for reading, Rakhigarhi excavation has restarted as I understand. A different kind of t-log Manisha. The Fermana dawn pic is beautiful. Our lack of respect for history stems from too much history scattered around in India. By the time we start caring, it will be gone. Thanks Tarun. 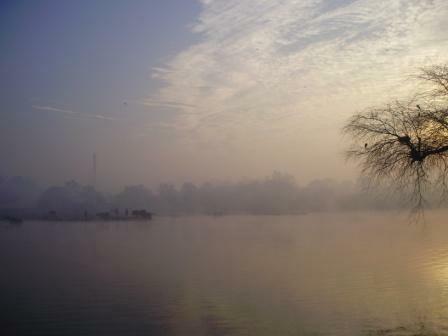 The dawn and the landscape both were magical ! This is a great post! I recently read that they were again digging in Rakhigarhi. I hope this time around they protect the site, maybe develop it too. They say this site could be bigger than Mohenjo Daro. A very well written travelogue, Manisha. I, myself, belong to Haryana and agree with every line you have written in this article. I have had a fascination towards ancient civilization way back since we used to read about them in school text books. Though I also feel sorry about the sad condition in which some of these sites like Rakhigarhi presently are, still on other hand it is heartening to see that folks like you are having a keen interest in it. Keep it up! Lothal is decent, the site is lying open but there is a museum next door which has good stuff. Last year when I visited Kalibangan, the site was all covered in tarpaulins and museum was closed for renovation. This article was written 9 years ago. Time flies.